Q. Will I lose control of my data or processes? A. No, OHI staff access the accounting file through a secure Remote Desktop tool such as Windows Remote Desktop or GoToMyPC. The accounting file continues to reside on the client servers/computers. If a client uses a web-­‐based property accounting software such as Appfolio, then all we need is another user login. In addition, we can also access the data such as bank statements, invoices etc. through remote access, if the client so prefers. However, this option slows down the process by about 20%. We can also access accounting data directly from bank logins using a View Only Access account. Q. Do we need to change our accounting processes before we outsource them? A. No, OHI can begin the engagement by transitioning your existing processes with minimal/no changes. Any significant process related change is only done if the existing process is majorly inefficient or cumbersome or prone to breaking-down. Q. How do we communicate with our accountants in India? Q. How many clients use your services in USA? A. Since last ten years, we have worked with more than 300 clients. We serve more than 50+clients in real estate alone across residential and commercial real estate segments. We currently handle the accounting of more than 75000 units under management. Q. How does your company ensure data security? Q. How will the offshore accountants know about US Accounting practices and our internal accounting practices? A. OHI staff are highly experienced with an average US accounting experience of six years. Our accountants are trained extensively in standard US accounting and business practices. Our planning work before we start processing includes detailed documentation of the client’s accounting practices, operating procedures and critical timelines. We also refer to past transactions if the prior set of books/accounts is a reliable one. Q. Can accountants be working during US business hours? Q. Can I reduce the staff during low work-load season or easily terminate the agreement? A. Yes, outsourcing solutions enable you to have a flexible staffing model where staffing can be reduced easily with short notice periods. In addition, it is easy to terminate the contract with no penalties by providing sufficient pre-specified notice of 15/30 days. Q. Which property management and accounting software does your staff know? A. We have high expertise across all popular real estate property management and accounting software used in US. Some examples include Yardi (Voyager and Genesis versions), Appfolio, MRI, QB (All Versions), Xero, Timberline , Onesite, and Spectra among others. Q. Please elaborate on your accounting experience in real estate/property management sector? Our accounting experience covers the entire range of real estate players across the value chain. We provide real estate accounting services to real estate agents/brokers, property management companies, owners, condominium associations and real estate investment trusts. Our rich experience helps us to provide expertise across the entire range of accounting functions with minimal learning curve. We are also able to provide custom accounting reports to meet information and reporting requirements of important stakeholders such as banks, investors, customers and of-course the property management companies themselves. We have reliable experience across most popular real estate accounting packages across Accounts Payable, Tenant Management, General Ledger, Disbursement/Banking and Reporting modules. We have good experience across most real estate packages such as Timberline, Yardi Genesis and Voyager, Appfolio, MRI, Spectra, QuickBooks, RealPage Onesite among others. For more details, please refer our property management service section for a detailed list of services. We have clients in real estate sector across Florida, California, Seattle, New York, Colorado, Texas among others. Q. What areas do you handle in real estate accounting? A.Our property accountants can easily handle most aspects of property accounting, whether it is running rent roll, tenant lease management, utility bills processing and bill backs, accounts payables & vendor management, reconciliations(bank, merchant account, credit card, escrows, mortgages) contractual and sub-contract accounting, monthly closing, month operating report preparations, replacement reserve forms, CAM reconciliations, year-end finalization and detailed management reports including dashboards. We also perform non accounting activities such as Craig List postings, tenant feedback surveys, maintenance work order creation and tracking and many other miscellaneous activities. We also have good experience in preparing investor and bank related documents. Q. What real estate accounting experience and credentials do you offer? Q. Why should I hire you as real estate accounting company? Additionally our robust infrastructure, emphasis on data security, highly qualified accounting staff, unique training and evaluation practices and unrelenting focus on quality makes us the right choice for your company. The strength and reliability of our value proposition is validated by high longevity of our outsourcing contracts. Most of our clients have been working with us for many years (some since inception of the company). Please refer our client profiles section for a sample list of our clients. Q. How soon can you start managing accounts for our property management / real estate firm? A. It depends upon the process requirement e.g. for a small property management firm we can start the process immediately. In case of large firms, there is a detailed migration and scaled up plan drafted by our transitioning team, typically followed by or performed simultaneously with a pilot phase. The pilot phase typically lasts from one-two months. Most clients are able to complete the transition and handover in a period of three months. Q. The firm already has an accounting staff. Should I be replacing them with your services? A. This depends on the nature of the processes and scale of operations. Most small clients prefer an outright replacement as the underlying complexity and scale of operations are limited. The larger clients typically may retain a senior accountant to supervise the entire operations, transfer funds, and coordinate with banks. Q. Our condominium association or property management company handles our accounting. Why should we change? Q. How is Construction accounting different than Other Accounting? A. In various aspects, construction accounting is different as compared to accounting for other businesses. In general, there are 2 main ways to maintain construction accounts. Percentage of Project Completion – In this way, accountant has to update books on the basis of stages of project completion i.e. Income/ Expense will be accounted for once a pre-decided stage of project will be completed. The revenue recognition based on achievement of a pre-decided milestone is also called as progressive billing/invoicing. Another way is Project Based – in this method an accountant considers every project as a separate entity. At the commencement of every project, a new set of books is prepared with a new chart of accounts, separate project-wise income and expense entries and often with even new bank accounts specifically dedicated to the project. Q. What services do you provide under construction accounting? A. We have a good understanding of construction accounting concepts/terms such as job-codes, cost-codes, change orders, draw sheets, retainage/holdback, commitment invoices, construction contracts and general construction expense types. We can process accounts payable in both ways: two way match (PO with invoice) and three way match (PO, invoice and packing slip/goods receipts) processes. Our accountants have good expertise in processing construction company invoices with complexities such as divisional accounting, multi location allocations, multi-project allocations, draw order invoices, commitment invoice, retainage/holdback reconciliation among others. We also have expertise in document filing, accounts receivable processing, general ledger maintenance, month-end closing including expense accruals, bank and loan reconciliations, and financial statement preparations. Our expertise in construction accounting across US and Canada enables us to also handle customized services. We have a high level of expertise in Timberline and QuickBooks in construction accounting. In QuickBooks, we have a high degree of familiarity with and understanding of concepts such as classes, jobs and associated reports. In Timberline, our accountants are familiar with the different reports, search tools, header and distribution windows, divisional coding among others. Our extensive work with many construction companies has provided us with good industry expertise in this area. Q. Do I need to take services of CPA for tax services? A. We focus on providing Construction Accounting Services with utmost accuracy and timeliness. We are able to process bookkeeping, financial closing, payroll and provide audit support activities. However, we do not perform audits and annual compilations or provide opinions on your financial statements. We can assist and coordinate these functions with your current CPA to ensure that they have the necessary information to prepare these for you. A. It is unlikely that you will lose control by outsourcing your accounting. In most cases, clients experience an increase in control as there are able to hire a dedicated offshore accountant instead of a part-time accountant. You can also easily communicate with your accountant through email, Skype, phone calls and more. Our team will revert promptly and work diligently to execute their work responsibilities and deliver up-to-date financial output. Since our accountants are qualified and experienced, they require minimum supervision and attention. Q. What software do I need to manage my construction accounting? A. Your software needs are dependent upon the accounting needs of your business. It depends on volume & type of projects, annual revenue, number of suppliers & subcontractors and several other factors you want to manage through it. Our team is capable of handling variety of construction accounting software ranging from a complete construction accounting package like Timberline to a small business QuickBooks construction accounting package. Q. Who will work on my data? A. Your day to day construction accounting services will be safe and work will be assigned to team of skilled professional construction bookkeepers/ accountants with several levels of construction accounting skills. Depending on the complexity and scale of the processes and work, we allocate junior accountants for simple accounting tasks and senior accountants for monthly financial preparations, management reporting and other complex tasks. We also allocate an engagement manager for projects that have four to five member team of dedicated accountants. A. Outsourcing does not impact the control the CPA has over their clients’ books. Accountability and control improves through outsourcing as we provide you a dedicated accountant for performing our services. The use of features like time tracking software, audit rail in accounting software, restricted access/action rights in software enhance accountability. Similarly the accountants can be easily communicated over through emails, Skype chats, and phone calls on US Phone Numbers (that land at our centre) make it easy to reach across to your accountants. Accountant will reply and work accordingly to deliver accurate and up-to-date financial output. You’ll require limited supervision and attention for bookkeeping quality control, once the process is established and instead you can invest more time in business increase opportunities. Q. How much experience does your team have in the ecommerce business? A. Our senior management team and operating team has a sound knowledge and good understanding of ecommerce specific processes as a part of our team was closely involved in setting and running a fully fledged ecommerce business for four years. This close involvement in execution of an ecommerce venture has given us a ringside view of the different ecommerce processes such as marketing, cataloging, price and inventory management, sourcing and shipments. Additionally, we have served multiple retail and online stores, who have used us for accounting and back-end processes. Q. How cost effective your services will be for my ecommerce business? A. 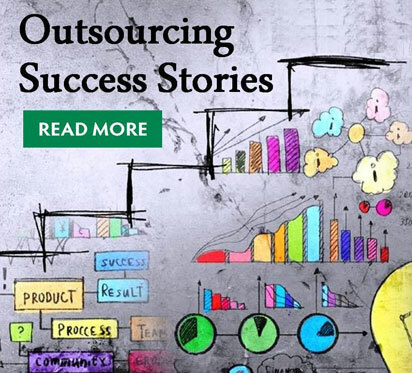 A key driver for outsourcing is the high cost savings associated with it. Our clients typically experience cost savings ranging from 30%-60% depending on the nature of business, process complexity, existing onshore costs etc. 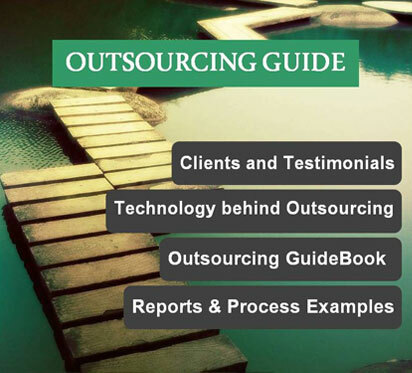 There are numerous other advantages that make outsourcing a significant value creating proposition. The flexibility in staffing structure enables firms to higher more during the busy holiday season and lower staffing levels in lean seasons. Many small ecommerce shops work with part-time on shore staff to reduce costs. They can easily hire full-time dedicated employees, resulting in faster completion of tasks of work such as updating catalogue, modifying stock and price levels, better responses to issues and challenges. In sum, clients see cost savings, better operations and faster responses to order trends. Q. Why should I need catalog management services after setting up my website? A. The success of your ecommerce website depends heavily on quality and depth of your product catalog, its freshness (particularly in apparel and electronics), quality and way of presentation. For E-Commerce businesses, it’s probably the most important consideration while building web site. Unfortunately, it can often remain unchanged after the initial few months. A catalog update service enables you to bring new SKUs LIVE faster, update product descriptions, phase out old items and run new promotions and prices. Q. What kind of “Back End” services do you offer? A. We can provide you accounting, price monitoring, order processing and catalogue management services. For detailed information about each section, please refer the list of services. click here. Q. Can I see all of my accounts in real time or I have to wait before I have access to information from you? A. It depends upon volume of your business and your reporting requirements. One can see books of account in real time through ONLINE accounting software which can serve only small business entrepreneur. We recommend desktop version of software for the mid & large size firms. We can provide you all the reports & data within fortnight as and when required by you. Q. Will I required to supervise the whole e-commerce process outsource to you? A. We assign dedicated team to perform your services so that you can focus completely on increasing your business. Once the initial transition is over, most processes require minimal intervention from your end. However the smooth running of any process depends on right staffing, well documented processes and a smooth flow of information.